t’s 11 a.m. and Cathy Ford has been hard at work in a tiny clinic room since 8 a.m. She has examined and diagnosed every patient that has walked through the clinic’s black metal door. She sits on a stool next to a small desk, jotting down notes as an interpreter translates for a patient. Ford listens intently and asks pointed questions, often using her hands to communicate with both the interpreter and the patient. A nurse practitioner student occasionally asks questions, and Ford confers with the student to try and make a right diagnosis. “We follow rabbit trails to make the right diagnosis,” Ford said. Ford has been seeing patients for the past three days at the Refuge International clinic in San Raymundo, Guatemala. She has volunteered with a group of eight nurse practitioners from Viterbo University in Wisconsin. Nurse practitioners are nurses with advanced education and training in the diagnosis of a variety of primary health care issues. 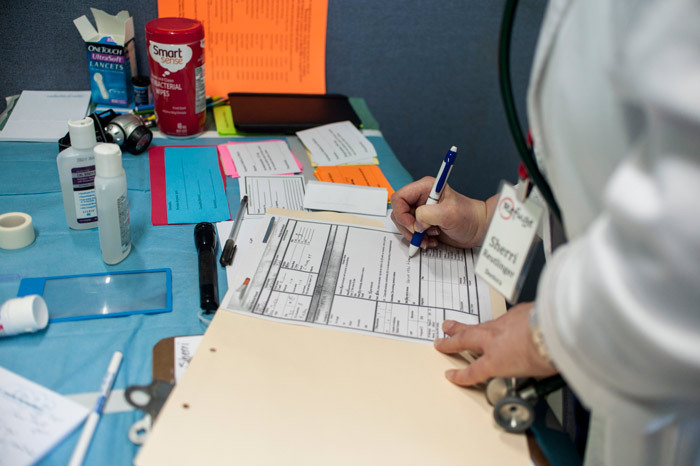 There is often a shortage of primary care physicians, and the demand for nurse practitioners has increased to fill that void. Nurse practitioners are qualified to provide care in a wide spectrum, from chronic disease management or caring for people of all ages. The group of nurse practitioners and students from Viterbo University came to Guatemala to gain experience in primary care and experience first hand the health care differences of a developing country. Ford has been a nurse practitioner for 13 years. After 25 years as a nurse, Ford decided that she wanted and could do more in terms of her career. Initially, she wanted to be a nurse practitioner when she first pursued her bachelor’s degree, but due of a number of family events, she was unable to go back to school until 20 years later. This was Ford’s first medical mission. Ford said she has seen patients whose condition and symptoms would be considered critical in the United States. Something as simple as putting on a hot or cold compress on could be difficult for these patients, Ford said. They might not have something to make things hot or cold where they live. “There’s so much need. The environment is so different from where I work,” Ford said. There are strict limitations in terms of availability of medicine and labs, she said. A man in his 70s was brought in for a consultation in Ford’s exam room. She quickly examined his blood pressure and determined it was extremely high, 210/100. Ford needed to put him on medication to lower his blood pressure, a medication that can harm kidney function. Usually, labs are done to determine whether a patient’s kidneys are strong enough to take the medicine. Ford needed to make a decision without the help of lab results. It was either give the man the medicine and risk kidney damage or not give him the medicine and risk a stroke. At the clinic, Ford worked as one of four faculty overseeing nurse practitioner students in their final training. Both nurse practitioners and students have been working collaboratively to provide general medicine consultation for patients in the clinic. Ford said it is a great opportunity for the students to learn and grow in their skills. Sherri Reutlinger, a clinical nurse specialist, is in the final year of her nurse practitioner degree at Viterbo University. “It has been very beneficial for me in helping me develop my skills and critical thinking and diagnostic reasoning,” Reutlinger said. Imelda Toshcon arrived at the clinic with an ulcer in one of her ankles. She had fallen a couple years ago and the wound had gotten infected. She was diabetic so the healing in her body was slow. Throughout the years Imelda had lived in constant fear that one day the ulcer would contract an infection that could become so widespread a doctor would need to cut her leg off. 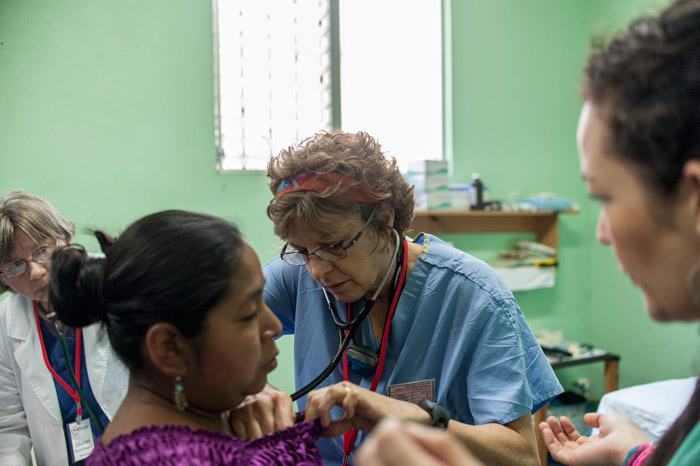 After years of being treated by Guatemalan doctors, Toshcon had been in contact with a foreign doctor she met at a medical mission. She would send photos of her wound to the doctor who would respond with ways to treat her wound. The doctor had referred her to the Refuge International San Raymundo clinic. Toshcon had arrived at the clinic thinking there could be possible amputation, but after being examined by Reutlinger, she was told she was doing fine and skin had begun to regenerate. Her wound was slowly healing, but she would have to continue to take care of the wound for a long time. “I am so happy they didn’t operate on me,” Toshcon smiled. Reutlinger said the difference at the clinic from home is the availability of resources to treat patients. For instance, the clinic did not have wraps to treat her wound, which could make all the difference. Reutlinger said not being able to provide treatment they need is the hardest part. At her role, Reutlinger has learned you can’t do everything, you can only give it your best shot. 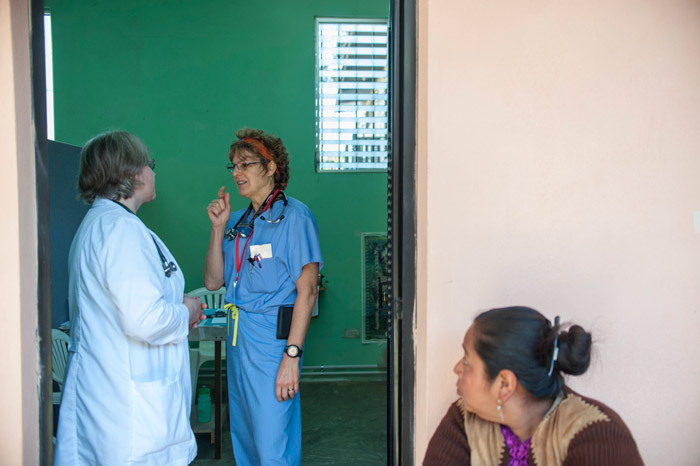 She sees her time at the San Raymundo clinic as a growth experience. “It’s very difficult to tell a patient, ‘this is what we know you need, it would be helpful to you, but we just don’t have it to give to you,’” Reutlinger said. After Jose was told he would not be receiving insulin, the interpreter Maries asked everyone in the room to join hands in prayer for the health of the man. Reutlinger said although she didn’t understand the prayer because it was in Spanish, she found the emotion in the room very moving. She could tell that this man appreciated that someone cared and was there for spiritual support.